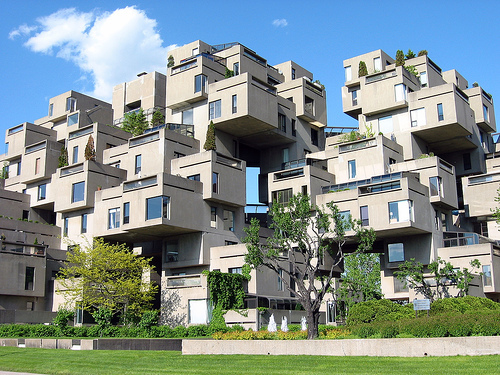 Community and housing complex Habitat 67 situated in Montreal, Canada, may be, is one of the best architectural creations and inventions. This is a strange building elaborated not for beauty but to satisfy functional people needs. Over 50 million people visited and attended it during the first year it was opened. “Fantastic experiment”, “architectural wonder” or “useless expenses”, let’s look. 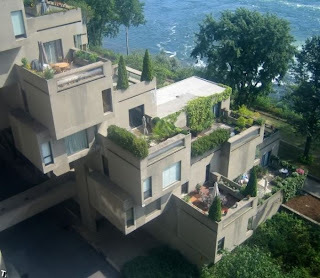 This Habitat was built as a pavilion for Expo 67, primarily it was just master’s thesis of Israeli architect Moshe Safdi. The base of this building is cube, it’s everywhere, the whole Habitat consists of these elements symbolizing steadiness, longevity, wisdom and perfection in the end. The building is designed only in one color – grey, no more, and it’s not surprising that Habitat bears a strong resemblance to ancient Babylonian or Assyrian constructions, or even modern Arabic houses built in hot and dry deserts. In spite of that Habitat got a great popularity as one of the most functional and purposeful constrictions all over the world. The original project calculated upon 1000 apartments (including schools and shops), but in result it was built 158 flats in this complex, and each of them has from one to four bedrooms and also verandas, balconies and small gardens. 354 cubes are arranged such way that it seems very irregular but protuberances and niches are situated very adroitly and every apartment has its own garden on the roof of its lower neighbour. It’s somewhat difficult to count up a number of the floors but in sum they are 12. Moshe Safdi didn’t like suburban and dreamt about new perspective type of city housing which could provide dwelling for maximally great number of people and with it wide personal spaces for everyone. Every apartment is unique and inimitable and which is more it seems that you live apart, in your personal out-of-town mansion, without neighbours. 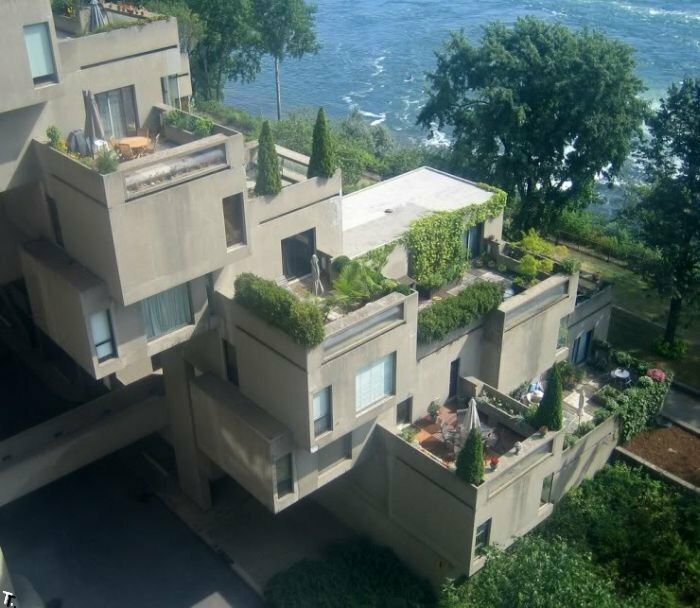 From windows and small yards residents can admire the landscapes of Saint Lawrence River. The architect organized mass production of building blocks and slabs; straight here, on the peninsula la Cité du Havre was a factory where details were being constructed into the models and placed according to the project. The whole cost of all these construction is $22 195 920, average price for the flat is near $140 000. This factor and sizable Habitat’s remoteness from the Montreal’s centre made dwelling here very popular and not affordable for people. Architect wanted to offer a “fragment of paradise for everyone”, for families, couples or retried people, but prices here increased very quickly. Now this building is a bright example of futurism and brutalism and it’s possible that next generation of designers and architects will borrow Safdi’s ideas at new places.